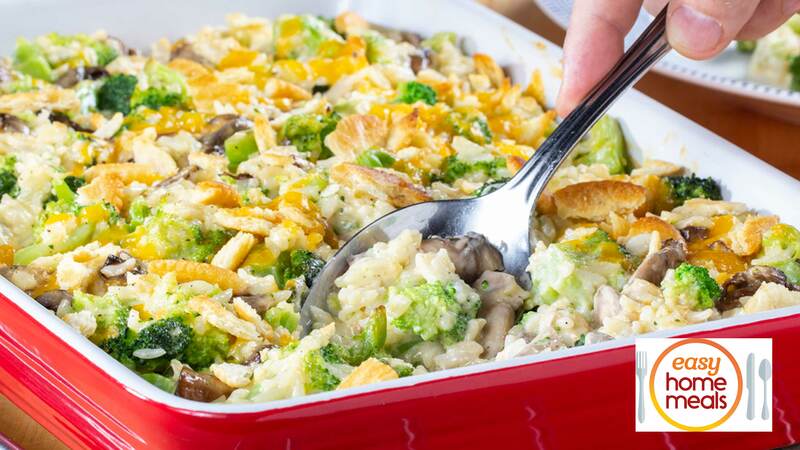 Sometimes the simplest things are the best and this Broccoli Cheddar Casserole is one of them. Whether you serve this with burgers for a quick weeknight dinner or it's part of your Thanksgiving Day line up, get ready for lots of ooh's and aah's. And since it starts with a few freezer and refrigerator shortcuts, all the better. Preheat oven to 375 degrees F. Coat a 9x13-inch baking dish with cooking spray. In a deep skillet over medium heat, melt butter. Add onion and cook 3 minutes. Stir in flour and cook 2 minutes. Add broth and half-and-half and heat until mixture begins to thicken, stirring occasionally. Remove from heat, add 1-1/2 cups of cheese, and stir until melted. Stir in broccoli, mushrooms, rice, garlic powder, salt, and pepper; mix well. Spoon mixture into baking dish and cover with aluminum foil. Bake 25 minutes. In a small bowl, mix crushed crackers and remaining 1/2 cup cheese. Uncover casserole, sprinkle cheese mixture on top, and continue to bake 10 to 15 more minutes or until golden and bubbly. Tip: This is a great way to use up leftover rice or you can buy packages of precooked rice.